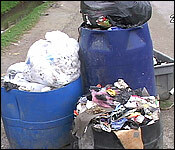 Last night the headline was about the almost one million dollars in backed-up payments that the Belize City Council owes its garbage contractor, Belize Waste Control. Well, today Waste Control picked up the Northside garbage - even if it did so a little later than usual. And maybe that's because - after our story last night - we are told the City came through with a partial payment - and a plan to pay off the arrears. 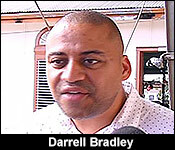 But today when we spoke to the Mayor Darrell Bradley, he was mostly unfazed - he said it's a chronic problem:..
"For every year that I've been mayor, that has happened and for every year that the former, has been mayor, that has happened. It wouldn't surprise me in relation to us being in arrears. A substantial period. I think if I am not mistaken, the most we've been in arrears is 16 weeks. Again, because its $50,000 per week. That represent about $800,000 in terms of the numbers. It would not surprise that we are in arrears, but that's not an alarming situation. I don't know that there is a situation or there is any animosity between them and us. I don't know if there is any situation with any slowage or stoppage of garbage. That's actually something that's made up. I do know that we have a regular recurrent annual problem with them which is a result of the contract itself." "That notwithstanding the City Council is in a very healthy financial position and one of the evidence of that is our ability to actually commit and to go through with a salary increase which came effective on the 1st December of this year. So that this would affect all non-management staff of the Belize City Council and people may realize that this present moment that the city employs about 450 people and we are having a salary increase across the board of 4% for every person on the rank of a supervisor and the coordinator and that's in a certain pay scale and 6% for every staff below that rank." "So that this is going to be very meaningful for those people who pick up the garbage, who are traffic officers, who really are the heart and soul of our city." "Mayor, some might say why don't you pay your bill with Waste Control?" "We don't have a bill with Waste Control. We have a situation where the Belize City Council collects the money in December and April. So that in December and April we collect roughly about 15 million dollars. That's more that 16% of what we collect in a year. So that in all of those periods we collect that money in 2 months and what I am saying is that within those 2 month period we pay off all of our debts and some would respond to you, the person who pick up your garbage on Waste Control, the person who guides your traffic and protects you and so, doesn't that person deserves a raise? That person is the one who makes our city works, so rather than paying $51,000 per week to a service contractor which we could have negotiated or we could have done something in terms of a better deal or whatever, I would actually prefer to invest that money in the people who labor and toil for our city and the people who clean out our drains and who do the jobs that ordinary people don't want to do - to reflect that they have a better Christmas." "Some might say they could have waited 2-3 months down the road." "I say that they can't wait. I say, and I am the mayor!"